Crawford, Murphy & Tilly (CMT) received a Grand Award at the American Council of Engineering Companies of Missouri (ACEC-MO) Engineering Excellence Awards banquet on February 8, 2018. CMT served as the lead designer on the Liberty Wastewater Treatment Plant design-build project; the first project of its kind in Missouri. CMT worked closely with the design-build team members Goodwin Brothers Construction and GBA, as well as the City of Liberty, MO to allow project goals to be realized including new conveyance and treatment facilities, maintenance facilities and administrative offices. “We’d like to thank ACEC for this award, it is truly an honor,” said Scott Knight, PE, CMT’s project manager for the project. “This project is an excellent example of the benefits associated with the design-build delivery method. On behalf of CMT I want to thank the City of Liberty for trusting our design-build team to help them realize their vision of this important project. I also want to thank Goodwin Brothers Construction for their leadership and collaboration that made this project so successful.” GBA (Lenexa, KS) assisted CMT with the design effort, and was responsible for one of the highlights of the project – the new Administration Building. This project introduced many firsts for Missouri. 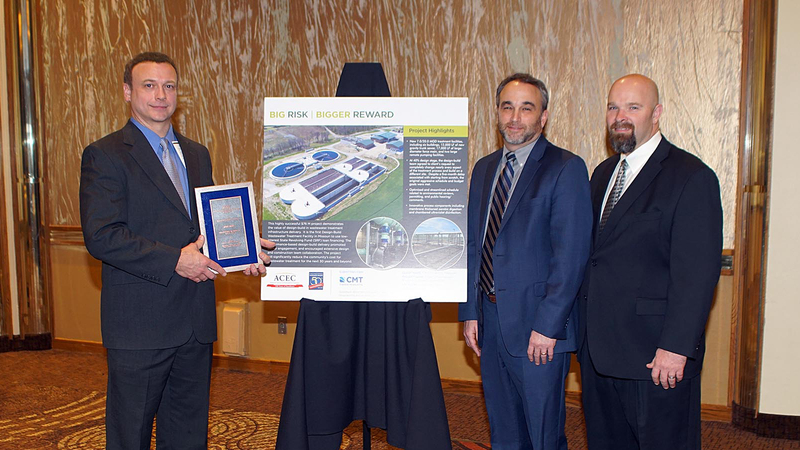 It was the first wastewater treatment plant project utilizing the design-build delivery method to be financed through a low-interest State Revolving Fund (SRF) loan. Going through this process for the first time required clearing a few hurdles, but it was well worth the effort. SRF financing will save the City nearly $40 million in interest compared with traditional financing methods. The Liberty project demonstrates a client-focused approach to the design-build method that is based upon enhanced client input during the process, with client satisfaction as the primary measure of success. The result is a city that has reclaimed its own destiny by having their own wastewater treatment facility as opposed to paying another community for treatment, an endeavor that will save Liberty an estimated $28 million over the next 30 years.